To be completely honest, I'm not really into sweets. 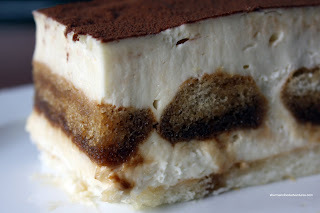 Well, it's not that I don't like sweet things, I just prefer finger food more than anything (such as appetizers). Thus, I am never one to save room for dessert or a sweet drink after a meal. Unlike Mijune, who has a 2nd stomach reserved for desserts, I tend to subliminally avoid pastries. 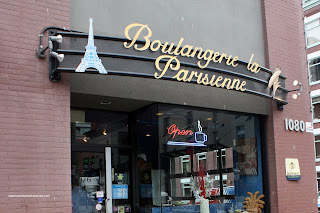 However, this time around, as I was leaving Bistro Sakana, I had the sudden urge to walk over to Boulangerie la Paisienne. Consider it reminiscing about ol' times. I used to live within a stone's throw from here; but haven't been back since I moved 5 years ago. I only wanted to get a few items; but call it the power of suggestion or just plain lack of self-control, I ended up with almost a dozen. Seeing how Mijune not particularly liking the items she tried on her visit, I went for a different selection. One of the first things that caught my attention was the Tiramisu. It was pretty mild being not too sweet. However, I thought the whole thing was rather bland in general. I didn't think that there was enough sweetness or espresso flavour. With that being said, the texture was silky smooth and the lady fingers were n ot dry. I gave the entire Blueberry Tart to my daughter though (well, not before taking a bite). 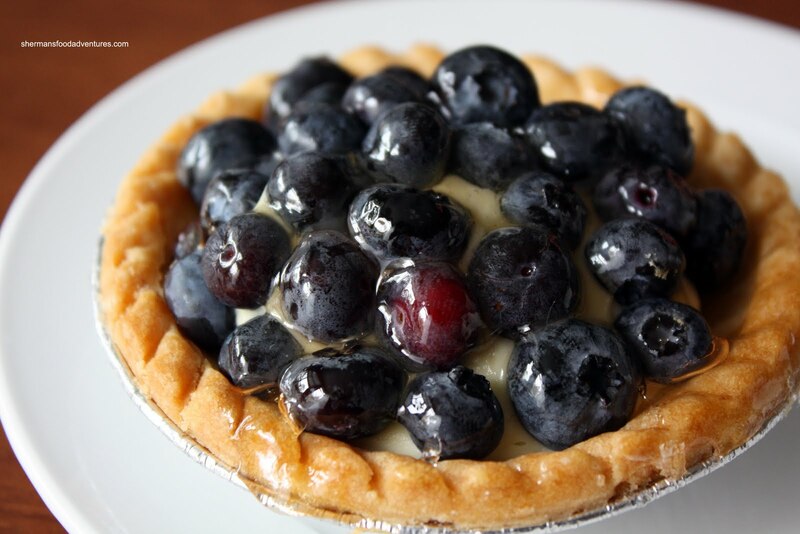 The blueberries were really fresh and I enjoyed the semi-sweet custard. However, I wasn't that big of a fan of the crust. It was a bit hard and not as buttery as others I've had lately. That would be the same for the Lemon Tart as well. If I wasn't a sucker for lemon tarts, I probably would've never chose this one based on its appearance. I know, I know, many lemon tarts look this way and its all in the taste and texture. Yet, this time around, the looks said it all. 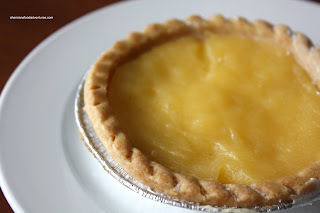 The same hard flavourless crust gave way to a lemon filling that I can only describe as unrefined. Unlike the lemon tart from Thomas Haas and the lemon pastry from Bakery Nouveau, this filling was quite pedestrian. The last item I'm going to write about is the Napolean. I didn't get to try this one because I gave it to my mom. 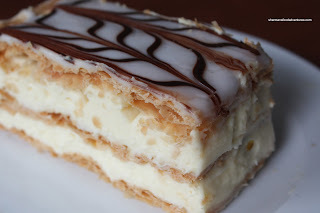 She really loves this particular dessert and since I'm indifferent towards desserts... My mom has had many Napoleans and h er favourite is still from Bon Ton. This particular one was very disappointing. The mille feuille was far too sweet and she thought it was almost like eating candy. Furthermore, the pastry was dry and hard to eat. Okay, I have to admit that this visit changed my feelings about this place. Nothing was horrid; but there was something off about everything we had. If one wasn't picky, I'm sure that the pastries here would do the job. However, if one was looking for better, just venture further into downtown visit La Boulangerie attached to the Sutton Hotel or Boulangerie Cho Pain. Mijune is probably not human... No one can eat that many desserts and look like that.